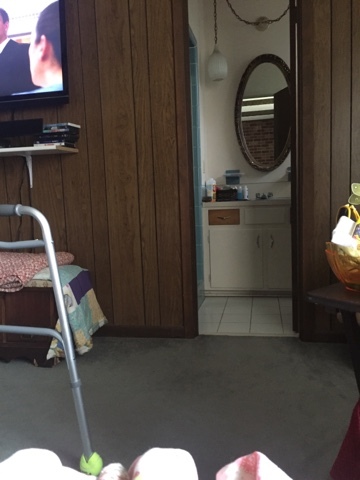 Footsteps of Grace : What a Difference a Day Can Make! I am beyond excited this afternoon !!! Almost giddy really !!!! I just have to praise my Jesus!!!! I walked from the chase to the bathroom today with out my walker !!!!! Yep that's right ! With out my walker,My God Is Good!!!!!! Now grant it is only like 12 steps but, it's 12 steps more than I have been able to take! Please continue to pray, I still get very out of breathe when I move around. It's like I am suffocating. My heart rate goes crazy and sets off chest pain. It's worth the effort though! I know Jesus helped me so I could see what I Know He is doing in me ! Thank you so much for all who prayed for me to rest better last night ! I slept thru the night until 9 am with out waking up at all ! That's a new record ! I normally am wake every 3 hrs . God heard your prayers and I felt them ! Thank you so much for lifting me up! I missed church agin this morning ... That's hard for me ... However I enjoyed time alone with Him in His word and prayer time! I then spent some quite time coloring in my inspirational coloring book.... I love to focus on Gods word in many different ways! One of my dear friends and I have been communicating thru letters for awhile now! I love it it's such a lost art... I truly enjoy receiving and writing in return. She shared with me a few letters back drawing a picture with a scripture verse each day. The fifteen minutes spent reflecting and drawing helps to engrave the image in your mind so when you see it again it reminds you of Gods Word ! I instantly fell in love with it ! 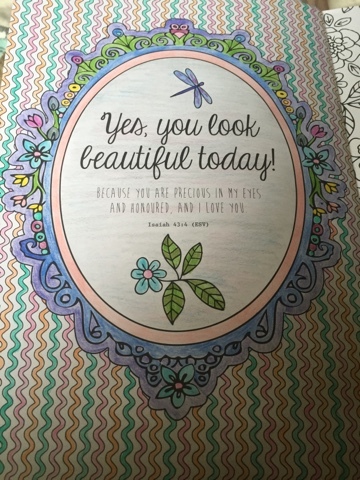 I haven't felt up to it lately so my coloring book was a way to still have that extra time with the Lord! I adore time with my heavenly Dad.... Not to mention how relaxing coloring can be !!! I think I may frame some of the pictures when I get better and hang them up ! I love having Gods Word displayed in my home!!! Tomorrow is a big day for us we will visit the Ear Nose and Throat Dr about the loss of my voice. I think of all the things we have delt with this one is the hardest for my family... I know God has plan and this too shall pass ... I promise to share the news when we get home tomorrow evening... Hope all of you have enjoyed this Lords Day ! Thanks for stopping by ... Praying for my sweet friend out there too ! Prayers going up here for you Mrs. Shellie. So glad that you rested last night and that your up and about trying to get well. God has a divine plan, and I know that He will show you what it is in His time. Keep your head up, don't get discouraged, you can do this. The healing power of God is upon you the more you stay true to Him. Love you and if there is anything you need that I can help you with, just ledt me know. Love ya sis!! Thank you so much Mrs Peggy !!! You are right God makes no mistakes and He will get glory from this ! I have seen His hands all in this from the moment I woke up !!! Thank you for your prayers !!! I appreciate them beyond words !!! Love you !